Watch us play a beautiful game! 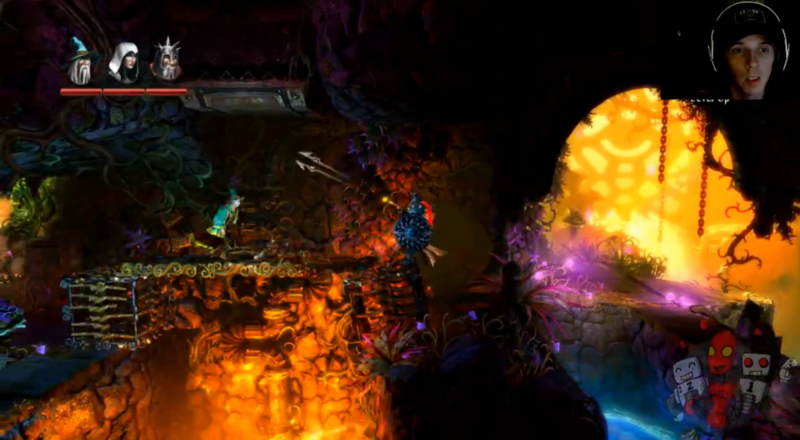 For our third episode, Friday Awesomely Live Co-Op returns with one of the most beautiful games ever created, Trine 2. The Knight (Bobby), Wizard (Baldy), and Thief (Smurph) venture through Shadowed Halls and Hushing Grove (57:25), and pick up a handful of achievements along the way. Watch the video below! The achievements were a bit buggy. Some achievements (ie. A Hail of Arrows) need to be completed by each hero, while others (ie. Surfboard Master) only require one hero to be a skillful master. Yet other achievements (ie. Pontius Baseball) just seem to play favorites and only reward certain bystanders and not others. Perhaps the heroes need to be standing close together to reap the reward of watching another hero do all the work. Who knows? I must apologize for the less than ideal video quality in our videos thus far. After this episode, I discovered my mistake and have corrected it. Videos from now on should be much clearer even when viewing in full-screen. Thanks for sticking with us while we iron out all of the kinks! This Friday, Baldy and Bobby are out, so we'll be doing something a bit different this week. I'll be recruiting my daughters and we'll play something a bit more kid-friendly. We'll also be playing earlier in the day so that certain co-stars can get to bed before their bed times. Keep an eye on Twitter or Facebook for the updated time. See you then! Strategically Dying In Zonaco Brought To You By F.A.L.C.O. Page created in 0.6846 seconds.